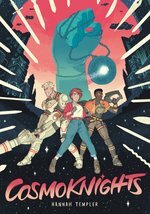 News / Hannah Templer's COSMOKNIGHTS begin their quest today! MARIETTA, GA (March 8, 2019) — Cosmoknights, the solo debut graphic novel by acclaimed cartoonist Hannah Templer (Jem and the Holograms, GLOW), today begins its life as a free webcomic at cosmoknights.space. Written, drawn, and colored by Templer, Cosmoknights is a thrilling galactic adventure set in a world where mech-suited warriors duel over the daughters of the aristocracy, and a fledgling resistance of lady knights aim to bring down the system from within. Cosmoknights celebrates International Women's Day by publishing its entire 25-page prologue today. Future updates will post scene-by-scene on cosmoknights.space, building to print publication by Top Shelf Productions in Fall 2019. Many retailers are already taking online pre-orders, including Amazon, Barnes & Noble, IndieBound, Hudson, and Penguin Random House — or you can speak to your local shop.